Steve Heinrichs convicted for his part in a pipeline protest in Burnaby, B.C. 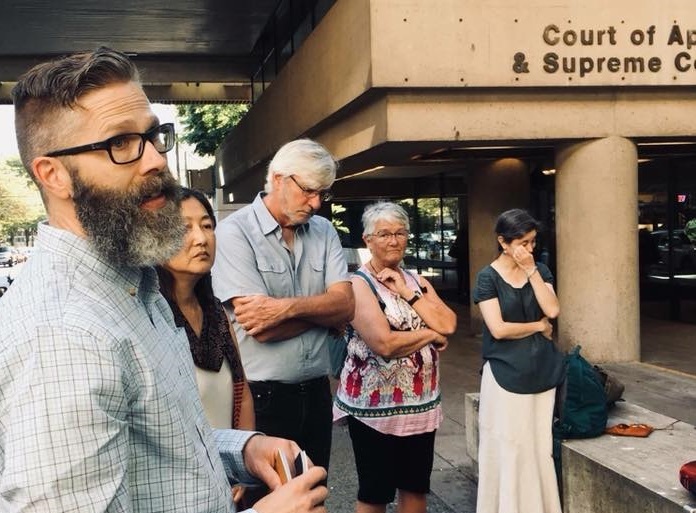 The day before, Heinrichs, the director of Indigenous-Settler Relations for Mennonite Church Canada, pleaded not guilty to the charge that was laid as a result of his solidarity action on April 20 in Burnaby with the Tsleil-Waututh land defenders who are resisting the expansion of Kinder Morgan’s Trans Mountain pipeline. (That action, he wrote in his “Burnaby Mountain Prayer Witness” document, “effectively blocked construction at the site for the day,” which led to his arrest.) He read a statement in court, explaining the motivations for his action, and how, in his mind, it was not in contempt of court or “the rule of law,” but in defence of fundamental Indigenous human rights. After hearing the evidence presented by the Crown and listening to Heinrichs’s statement, the judge concluded that to break the law is not a privilege afforded to those who appeal to a higher call in protesting matters of social injustice. There are many other legal options available to those wishing to express their disagreement, the judge determined. Despite the possibility of arrest, Metzger said that neither he nor Heinrichs understood it as a probability at the time. Because Metzger, as executive director, approved Heinrichs’s participation in the protest, expenses of that participation are considered MC Canada expenses, said Metzger. Heinrichs’s time during the trial and while he is in jail are considered personal time, at Heinrichs’s request. There is currently no MC Canada policy regarding staff participation in civil disobedience, but the Joint Council is currently reviewing the process of decision-making and may consider the development of a policy after further discernment. 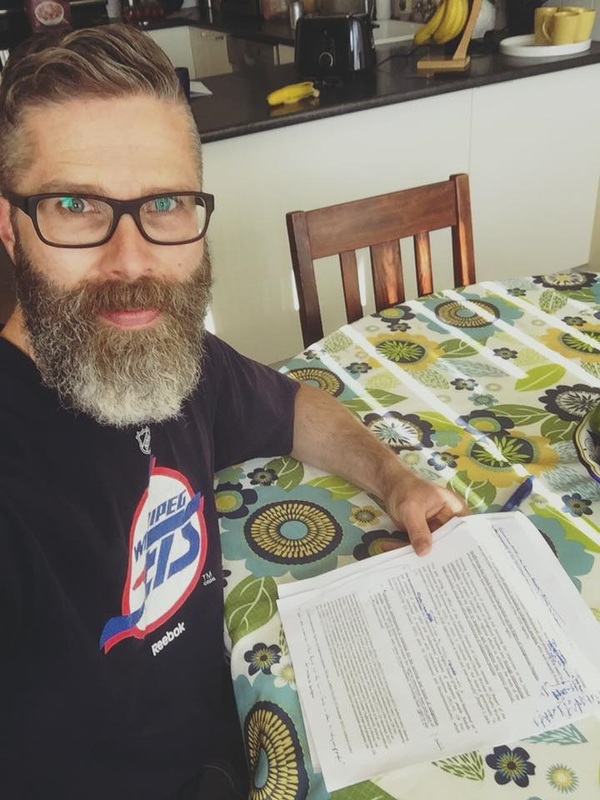 While some churches and congregants oppose Heinrichs’s actions and question whether he should continue to represent MC Canada as Indigenous-Settler Relations director, he has also received many comments of support, including from his boss. Visit here to read the statement Heinrichs read in court. Fossil fuels are a weapon against our future generations! Thank you, Steve and those in MCC who supported your actions. As a long-time activist with the United Church of Canada, I have always admired MCC and have been sad to see how conservative rather than progressive many in the Mennonite Church have become regarding social justice and global justice. The roots of your faith are steeped in the call to do justice and walk humbly with your God. I have been privileged to work beside and benefit from the friendship of Mennonites, and I pray they see that Menno is alive and doing God's work in Steve! Thank you to Steve and his extended family for hosting a meal on August 7th prior to Steve's court appearance. It was a delightful evening full of good humor and vigorous conversation. I took issue then, and take issue now, with the reporting in the CM of a clear call to indigenous solidarity and response to a regional church. MCBC is deeply conflicted with a significant minority at variance with the chair of service, peace and justice committee chair and executive minister. Consultation was perfunctory. I note that no congregation invited Steve to preach, and he served in a non-Mennonite church August 7. The above affirmation comes from another declining communion. These actions continue to fray the unity of MCBC, and the dusk of decline is becoming the dark of demise. These actions place in jeopardy the relationships Mennos are building through MCC with native communities in BC who are participating in Kinder Morgan pipeline. These actions will have deeply ambiguous results.